Candy wasn't as pretty as her sister Leigh, but she had a wistful little combination of something else in her make-up that made people love her and trust her and want her to be around. At Fort Benning, for instance, where Major Kane was stationed, Candy was absolutely essential to the success of every party or outing. Leigh and Mother, however, were of another stripe, and made the going rather difficult for everyone . . . especially for a certain young soldier. Later on, in fact when it was much too late, they discovered their mistake and from a distance Candy could smile her quiet, small, happy smile. 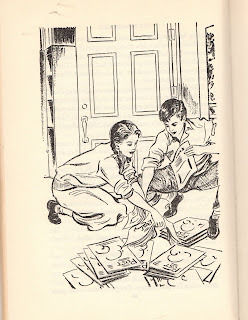 In the fourth of Janet Lambert's locket series, we take a sharp left away from the adventures of Penny Parrish and family. Let's meet Candy Kane! We open in New York City, where the Kane family is preparing to move to Fort Benning in Georgia as Major Kane is going into active service in the Army. Fourteen-year-old Candy Kane is on board, but her very beautiful (but shallow) eighteen-year-old sister Leigh and her equally shallow mother Marcia are decidedly against the move. Candy Kane meets Barton Reed. It's fascinating to start off a novel with two such challenging characters, especially after how delightful nearly all of the Parrish family were. It's also an untraditional start, as Candy Kane moves to Fort Benning with her father to keep house until Leigh and Marcia follow. But she does pretty well! She finds them a cook--Cleoretta--and meets the Reeds, the charming family next door. 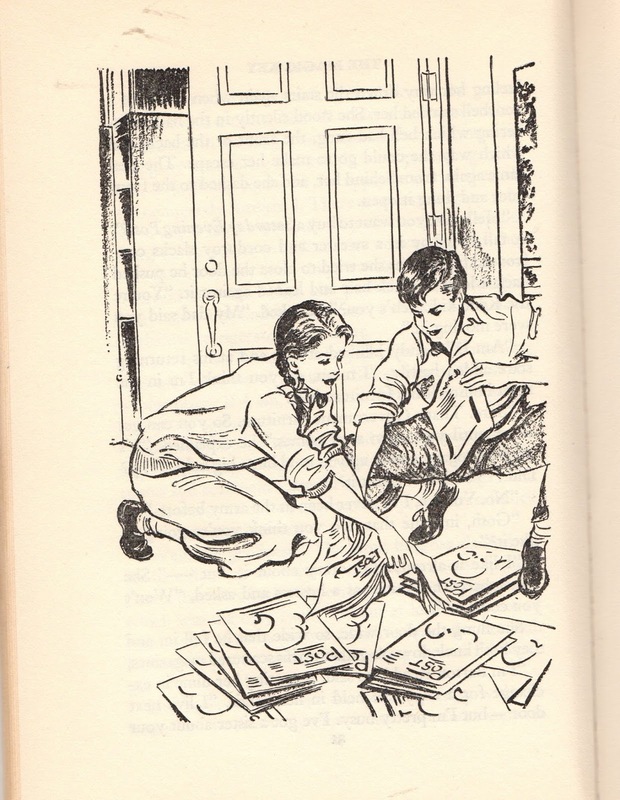 She first meets sixteen-year-old Barton Reed, then his sister Anne, and the whole family, including his lovely mother who she is soon calling Mom. "'My mother has wonderful taste.' She was afraid to meet Anne's eyes so she too sat down, and because the relaxed lines of the chair refused her the dignity of upright repose, she leaned her head back and remarked loudly and straight at the ceiling, 'Everyone admires my mother's taste. And if it weren't for Daddy and Leigh and me she could be the best interior decorator in the whole United States.'" Candy pretty much wanders around being helpful and sweet and awkward and endearing herself to one and all, including Jane Cameron, who works at the club. 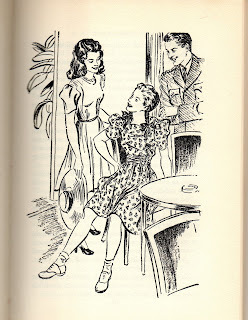 She even helps out Barton's steady and finds herself in an awkward position regarding the Junior Hop, when he invites Candy to make his steady jealous and she roundly turns him down. 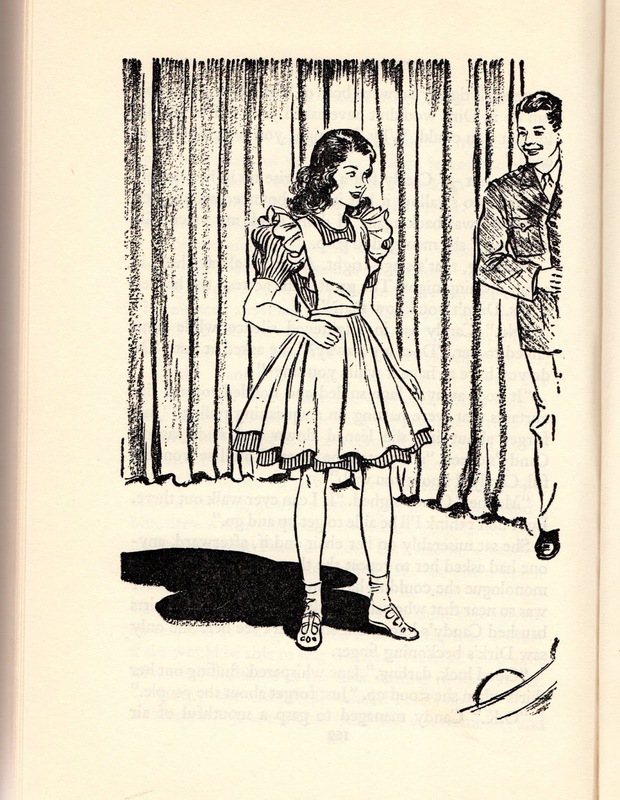 "Candy refused to admit even to herself that the Junior Hop held any interest for her. And on Saturday night she watched Anne pin twin gardenias in her black hair, then go twirling about her bedroom in chiffon skirts that billowed in the breezes she made. 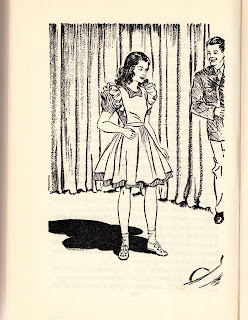 A dozen boys had asked Anne to save dances for them and she rattled off their names while Candy sat on the floor, her legs crossed under her blue pleated skirt, her small face tilted upward in pride without envy. But when Anne had driven off in Jack's family's car and her mother's velvet evening wrap Candy hated to return to her own empty house." So what does our Candy Kane do? "She was going to the hop after all. Not as the others went--inside with the heat and noise--but outside under the stars where the music would be softly sweet and she could lie on the ground and enjoy it." So she finds herself a spot under a tree near the club, spreads out her coat and "wilted bar of chocolate and a package of chewing gum. Not for all the world would she have changed places with Anne." "'Sometimes I wonder why I spend a lonely night,' she crooned happily to the opening bars of 'Star Dust.' not wondering, and certainly not lonely. She looked up at the sky and sang softly at first. Then because she was so happy there in the dark, she let her voice rise with the music until it reached the walk where a passing soldier heard it and stopped." So she sings, and he listens and soon introduces himself, and they sing together. His name is Corporal Dirk Morton and he walks her home, and she invites him to dinner, along with new friends Jane Cameron, her father, loyal nurse Nanna and Barton. She plans a marvelous party, but Marcia and Leigh are due to arrive soon and ruin all the fun. And they do. Leigh is snooty about Candy hanging around with soldiers, and disdainful of Corporal "Corp" Morton, which works out perfectly well since sweet Jane and he hit it off. Of course, when Leigh finds out Corp is the heir to a massive fortune, she changes her tune. But too late! Ha! She meets one of Corp's friends Chris Chandler. 'He's horrid. He hasn't any money or position, and he was just a reporter in New York. He was writing a play when he volunteered in the army so Dirk things he's a mental genius.'" And that might be all you need to know about Leigh and Marcia. What else happens? Candy serves as Barton's errand boy and dogsbody until she gets fed up and tells him off. She also sets up Jane and Dirk after a misunderstanding separates them. And even more exciting news? Corp recruits her to sing in a show on the post and Marcia reluctantly agrees, though she demands that Candy get a permanent, which Candy is less than excited about. She talks to Barton about the show and her hair. 'Thanks, Barton.' Candy walked to the curb and was in the middle of the street before his words shook her loose from her fear. She whirled around and there was nothing meek in her answer when she shouted back at him, 'I'll do all right. You don't have to worry about that. I'll do better than anyone else could do! And my hair will look all right, too.'" "'And now,' he was saying to them, 'we have a little girl who is going to sing for you. I know you will like her because she's the darling of the post. And more than that, she's all the Judy Garlands and Deanna Durbins, and sweet little girls you like to know, rolled into one. 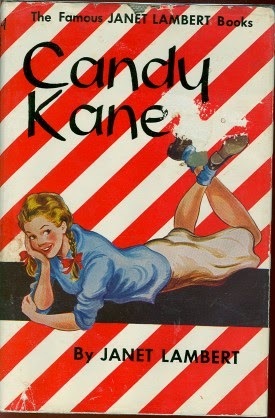 Here she is--Candy Kane.'" She sings and she's the darling of the show--even her mother sees her in a new light. And so does Barton. But don't worry, Candy is sensible as always. I have always dreamed of being a girl singer in a big band, so I love the plot of Candy singing and the description of her singing with such heart. "And Candy, sang, again and again. They refused to let her go until at last, in desperation, she stepped quite close to the edge of the stage and leaned across the footlights to coax, as if they were all her friends, 'Oh, thank you, so very much. But there's such a lot of wonderful show left, and--Well, don't you think it would be fun it we call sing 'Deep in the Heart of Texas' together, so we can clap our hands?'" So very sweet. I love the complexity of Candy's family relationships, and the complexity of her relationship with Barton--her naivete and her sweetness. And as opposed to the Parrish family stories of people who live and breathe Army, it's an interesting twist to meet a family who is just now experiencing Army life.